"A brilliant man would have found a way not to fight a war." 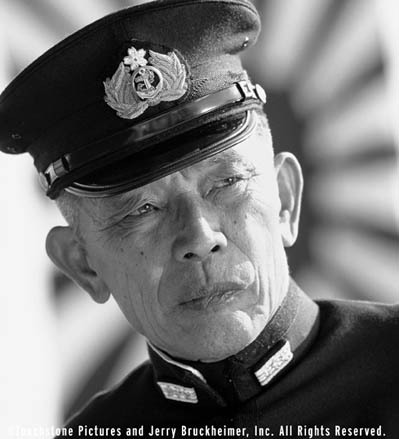 Veteran actor Mako portrays Admiral Yamamoto, who planned the attack on Pearl Harbor. He believes audiences in Japan will be critical of the movie for failing to demonstrate that Admiral Yamamoto tried to avoid war with United States, but lost out to General Tojo and Japans Army brass. NEW LOOK AT THE "ENEMY". thinking, War? What does that mean? I had seen footage of the war with China, all the destruction. I realized that's what war meant. It was as if I got hit in the solar plexus and couldn't breathe. A kind of fear and panic overtook my body." Mako was pleased with the global vision the film presents. "Historically, Hollywood pictures about World War II depict the Japanese as the evil side," he explains. "That's too much to cope with. Every war is started for a reason, usually economic, and in that sense this picture depicts the Japanese side in a fair light. There is no evil blackness about any of the characters." Although Mako is not a history buff, he was aware of Yamamoto's background. Educated at Harvard, Yamamoto had served as a naval attach to various Japanese embassies, including the United States. When Japan first considered war with America, Yamamoto objected and was very vocal about his position against a strike. "He was well learned in terms of Western culture," notes Mako. "So many from the military, admirals and generals, became ministers in the cabinet and steam-rolled the politics of that time. They had no perception of Western culture or attitudes and didn't understand Western resources. In that sense Yamamoto was up against the wall and out-numbered. Since it was inevitable that they were going to war, he did his job with the utmost." In a smart yet understated performance, Mako must bear the weight as the film's antagonist and he is allowed to portray Admiral Yamamoto as a reasoned, thoughtful strategist who becomes difficult for the audience to hiss. Two key lines define his character. When Yamamoto is congratulated for his brilliant attack plan, he replies, "A truly brilliant man would find a way not to go to war." Another cast member, Cary-Hiroyuki Tagawa, reportedly suggested Yamamoto's line complaining that the U.S. oil embargo was pushing Japan into war, a line that takes the edge off the Japanese motives. "We have awakened a sleeping giant and have instilled in him a terrible resolve." - Admiral Yamamoto after he was informed of the successful attack. Covers everything - pictures, notes, facts, maps, and more! Filming locations for the movie "Pearl Harbor" - with photos and addresses. Mr. Movie refers to Mako as a "screen legend" - Right on!! (Although be warned the rest of his review of the movie is negative).